Dilantin benefits and side effects | Does Dilantin Work? Dilantin is a popular type of anticonvulsant drug. It is often prescribed to people who regularly suffer from seizures, or patients who have recently undergone brain surgery or surgery on their nervous system. Dilantin comes in several forms, including extended-release capsules, chewable tablets, and liquid. 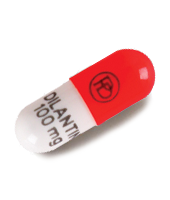 Dilantin is an anticonvulsant and an anti-epileptic drug available in the US by prescription. It may also be used off-label in order to control irregular heartbeats. Back in the 1970's, there was a push to also use Dilantin as an antidepressant, but due to financial concerns and a lack of clinical evidence, it was never approved for such use. Dilantin has many serious side effects and should only be taken under close medical supervision. It can reduce motor skills and dull reflexes, so try to avoid driving or operating heavy machinery until you know how it will affect you. Like many antidepressants, there is a risk of developing mood disorders and suicidal thoughts. Get in touch with your doctor immediately if you experience any of these symptoms. Because Dilantin is contraindicated for many other different drugs, including antidepressants, blood thinners, antacids, herbal supplements, and some vitamins, be sure to mention any and all other medications you are currently taking. Dilantin can make the birth control pill less effective, so be sure to have a backup form of contraception. Other side effects include headache, nausea, vomiting, constipation, dizziness, drowsiness, trouble sleeping, nervousness, and swollen/bleeding gums. How Does Dilantin Help Brain Function? Dilantin helps people who suffer from chronic seizures by reducing the amount of electrical activity in the brain that's responsible for most seizures. Wondering about which brain supplements contain this nootropic? Check our brain supplement reviews!